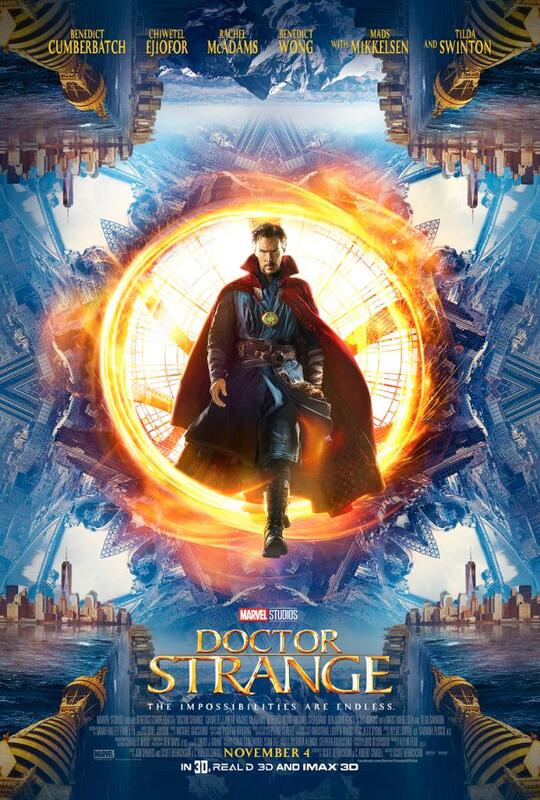 Talented surgeon Dr Stephen Strange (Benedict Cumberbatch) suffers irreperable damage to his hands in a car crash, ending his career in the process. When conventional medicine fails him, Strange follows a lead to Kathmandu and to an organisation of sorcerers defending the world from inter-dimensional attack. Marvel Studios represent the great commercial success story in Hollywood since the rise of Pixar, with a seemingly unstoppable string of hit movies coming like clockwork year in and year out. Following the release of Iron Man in 2008 the studio has managed to launch multi-film franchises based on comic book characters like Captain America, Thor, the Avengers, and even comparative unknowns including Ant-Man and the Guardians of the Galaxy. The most recent addition to their shared universe of film sagas is Doctor Strange, directed by Scott Derrickson and extending the science fiction-themed superhero world into the realms of sorcery and demons. To an extent it feels as if Marvel Studios are a victim of their own success. With each film becoming a significant commercial hit, the pressure must surely increase from each subsequent title to do at least as well. It would have to make the studio heads risk-averse. That appears to play out in Doctor Strange, which boasts some outstanding visual imagery but which restricts its narrative and characters to a deliberately safe and well-worn path. It makes the film a slightly difficult one to review, since the problem is not that it is an outright bad film. It is competent enough, has a beginning, middle and end, and some exciting action scenes in between. Its core problem is that based on the calibre of creators involved – Derrickson is a solid genre director – and the potential of the character, Doctor Strange should be a great film and not simply a watchable one. This is yet another by-the-numbers superhero origin, starring yet another snark-filled educated white man learning humility while rapidly mastering his abilities in order to fight an evil duplicate of himself by the climax. Coming so soon after Ant-Man duplicated near-identical story beats, it feels particularly dull this time around. It is not simply that Marvel are repeating themselves with diminishing returns each time. Doctor Strange is a character in particular that works better without an origin story. The story of how he went from arrogant neurosurgeon to sorcerer supreme is not a particularly interesting one. It does not dominate his identity, as Bruce Wayne’s childhood trauma effectively defines Batman. A far stronger film could have been made out of an original character having a supernatural experience – finding the demigod Zuul in their refrigerator, or what-have-you – and being referred to Stephen Strange for help. The film that has been produced spends so much time on establishing Strange that it almost entirely fails to give him an actual adventure in which to star. Benedict Cumberbatch is poorly cast as Strange. He spends the entire film struggling to maintain a fairly generic North American accent, and regularly appears weirdly uncomfortable on screen. He is also unconvincing every time the screenplay requires him to give a little quip or joke: the world of Doctor Strange is a dark and horrifying one, and the jokes written for the film feel very awkwardly inserted as a result. The supporting cast is strong but relatively underutilised. Mads Mikkelsen is a great choice to play the villain Kaecilius, but he is not given any scope in which to develop or fully express his character. Tilda Swinton is an intriguing choice for Strange’s mentor the Ancient One: clearly with a Chinese theatrical release in the offing the character was never going to be Tibetan, but replacing an Asian character with a Caucasian one was always going to be problematic. She is enormously watchable, as Swinton nearly always is, but there is a staggering amount of stereotypical dialogue there for her to try and sell to the audience. Most effective in the cast seem to be Benedict Wong as Wong, re-envisaged from culturally outdated manservant to talented sorcerer in his won right, and Chiwetel Ejiofor as Mordo, Strange’s fellow sorcerer. Mordo is clearly set up for bigger things in any prospective sequel, and therein lies the heart of Marvel’s problem. Marvel eyes its films as part of an ongoing franchise now, and that means the studio is spending less time than it should in ensuring each individual part of that franchise works well as a self-contained, satisfying story. By the end of Doctor Strange I felt confident that its sequel would likely be a huge amount of fun; it is just a pity that it took a whole movie to reach that stage. The film’s saving grace is its visual effects. Sorcerers warp and re-shape the world into kaleidoscopic patterns, chasing each other as up turns to down, left to right, and gravity can simply no longer be taken for granted. It cribs an awful lot from Christopher Nolan’s Inception, but pushes it to a fresh extreme. While there is far less of a narrative explanation for the transformation than in Nolan’s vastly superior work, it is nonetheless spectacular eye candy. There are a couple of nicely impressive action sequences as well, particularly a hospital fist-fight in which Strange is lying near death on a gurney while his soul trades blows with a ghost-like magican henchman. That is a pretty great scene, but sadly great action scenes rarely add up to a great movie with a story and dialogue to match.